Lava Beds National Monument covers a geographic area that is pock-marked with cinder cones and flooded with ancient lava flows. It's also in the desert and can be very hot and extremely dry during the summer months. Or it could be cold and pouring rain. But it's really fun to go to. We promise! See, the monument lands are covered with over 300 lava tubes (caves) that were formed when various volcanos and cinder cones were active which can present some challenging fun to the first (second, third...) time cave explorer. For us, the caves are great because it's an opportunity to crawl around on our bellies, get really dirty, explore all kinds of little passages, and have a lot of fun. Without tour guides, cave exploration takes on an entirely new meaning! 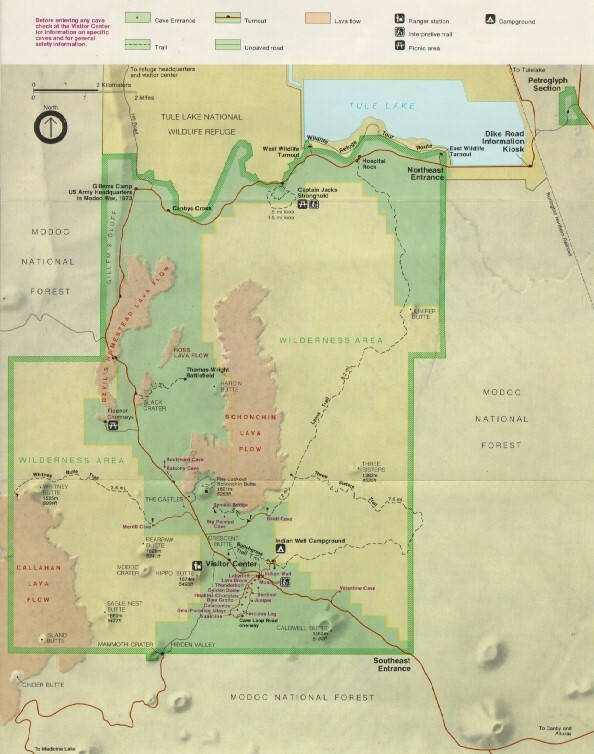 A fairly blurry map of the park (109K JPEG) from the brochure. Selected cave maps taken from various publications. Our personal photo album! Witness the fun and excitement second hand!